You've found the “U.S. Hampshire Pig Breeders” page here at Hobby Farm Wisdom! If this is the first time you have visited our site: Welcome! The Hampshire is arguably the oldest breed of domestic American pig and is currently the fourth “most recorded breed” of pig in the United States. 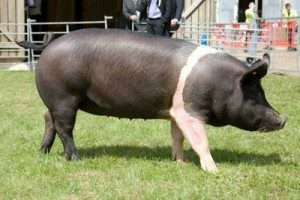 Developed from English breed pigs that were imported in the mid-1800s, Hampshire pigs are characterized by their black bodies with a whitish band around the middle and front legs as well as their erect ears. In terms of breeding, this breed is known for its excellent mothering qualities and their longevity in the sow. When raised for meat, they are considered well-muscled with a good carcass quality and fast growth rate. However, they do grow slower than many cross-breeds. Hampshire pigs have a docile temperament as well.